But as our makeshift Afrobeat ensemble wended through Greenwich Village, I had trouble grooving along to the rapid two-strike beat of the other clave players. 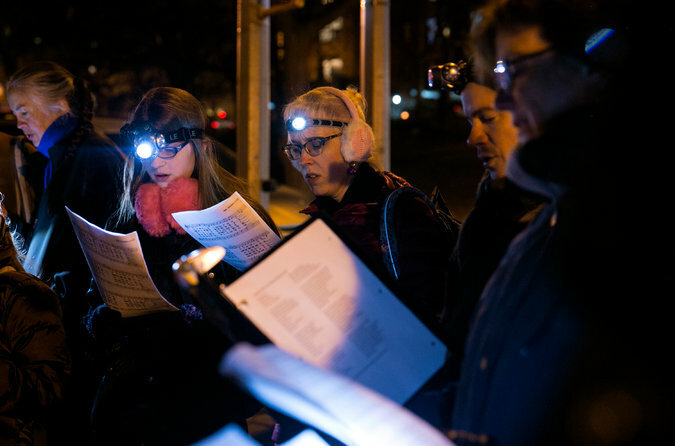 My problems were exacerbated by the absence of gloves — my hands were growing numb from the cold — and by my mounting performance anxiety, since each instrumental group would be given a solo at some point. Yet when the claves were highlighted, I miraculously blended in and was able to enjoy the rest of the journey, as did passers-by, who nearly all smiled and sometimes danced along. We ended at Two Boots Pizza and, as we awaited free pies, serenaded the other patrons. Amateur and professional singers led by Thomas McCargar (with his arm up) walked through Central Park, while singing the Prelude from Bach’s Cello Suite No. 1, very slowly. After downing a couple of slices, I took the subway uptown to the Fifth Avenue border of Central Park, where the singer Thomas McCargar led “Prelude,” a deconstructed, slowed-down vocal version (by the composer James Holt) of the Prelude from Bach’s Cello Suite No. 1. Four accomplished singers hummed along to varying pitches on their phones and we amateurs mimicked them as we strolled through the park, during the early 4:32 p.m. sunset, stopping under bridges to savor the soothing reverberations. Less calming was my next stop: Rockefeller Center, massed with tourists gawking at the Christmas tree. I was hoping to redeem my rhythmic skills with the Brazilian women’s drum line FogoAzul NYC. We participants in “Parranda de Inverno” had been invited to bring our own Brazilian percussion instruments. Lacking any, I took from home a small wooden bucket in which I store pens and other desktop detritus. I didn’t spot the drummers in the crowd, and had to wait until I heard a distant pounding to find them. My bucket, unsurprisingly, failed to make much of an auditory impact, especially compared with FogoAzul’s spirited, blue-shirted and spangly Santa-hatted performance through Midtown. 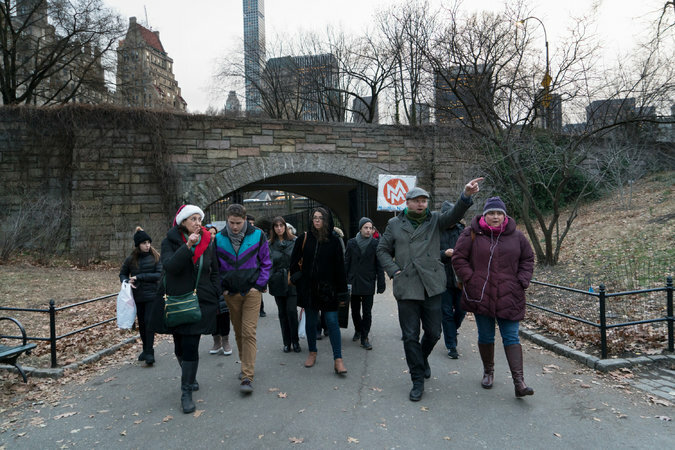 The conductor Malcolm J. Merriweather led a group of volunteer singers on a walk to the Cathedral Church of St. John the Divine in Manhattan. The faces of the people I had joined over the previous eight hours seemed to confirm their notions. A gratis celebration for and by the public, democratic and international in execution and scope, couldn’t help but stir up a sense of camaraderie and admit — on the shortest day of the year, after months of political tension and dissension — a few hopeful, harmonious rays of light.